Clicker Docs app (25.99) for iPad, developed by Crick Software , is a new iOS app that provides differentiated writing support for struggling writers. As one of Crick’s two new apps, Clicker Docs provides text only word banks and word prediction options offering support for primary aged writers in this Docs app. 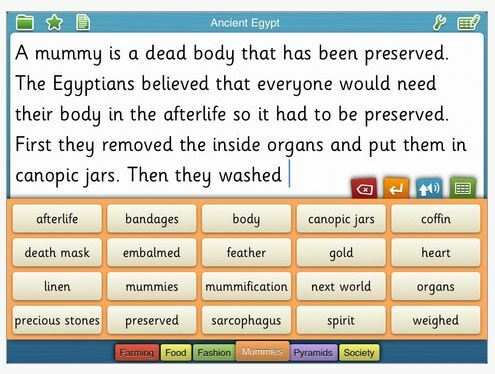 Clicker Sentences app provides a simpler picture based writing environment for emergent writers. A sequel in skill level to Clicker Sentences app, Clicker Docs app provides word prediction, text to speech and word bank support. Accessibility options include Swipe Grids on/off and Show Touches on/off (provides user a small dot of where they last touched for visual feedback). Switch accessibility is not yet available due to the lack of standardization with mobile devices but is a goal in the future of Crick Software. or alphabetically as seen below. Choice of writing supports are displayed by pressing the green keyboard tab above the word bank or keyboard allowing toggling between supports. Words in the word bank can be heard prior to selection by tapping the blue arrow which allows the word chosen to be spoken aloud. After it is spoken it can be selected for inserting into the document. This took a bit of practice but was easy to use and became more automatic with repetition (kids would get this much faster than I did!). 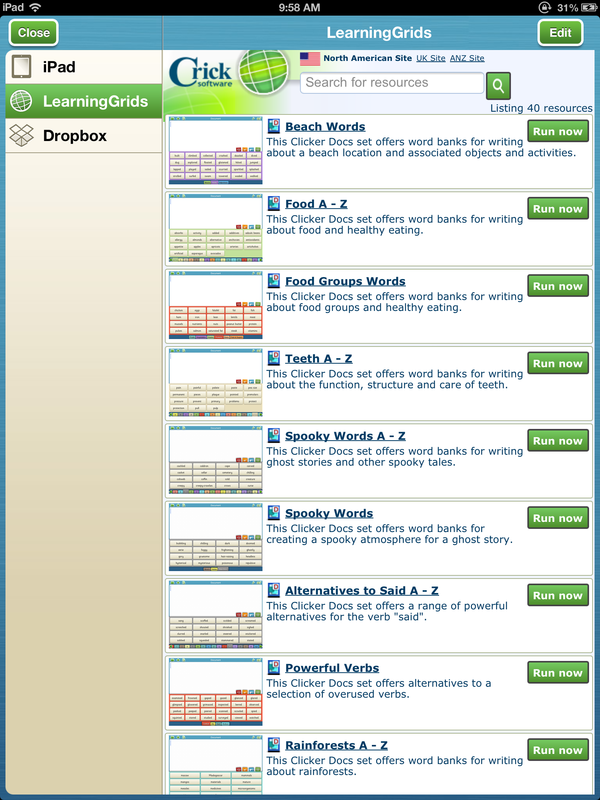 Writing environments or grid can be custom-made or are available within the app as shared by Crick through the LearningGrids resource. 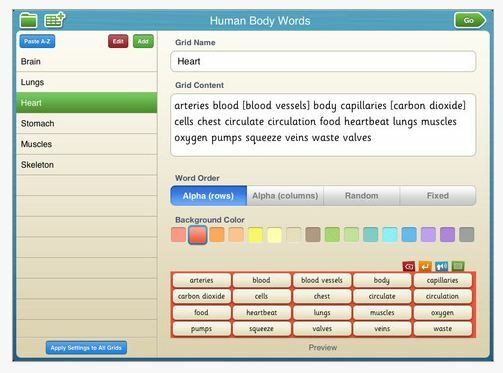 Below is an example of creating a customized grid of the human body allowing addition of unit words (content), choosing word order and color of the grid. The grid shown at the bottom provides a display of how the grid appears. Crick further supports users with shared grids provided through the LearningGrids menu within the app. Currently there are dozens of shared grids in the LearningGrids resource provided by Crick with a free registration. An option to transfer directly to Dropbox is also provided within the app for ease of workflow when creating and sharing grids between devices or for students (how many times have you had to take an iPad home to create on a students device for the next days use?? Probably too many times!). Crick also provides a User Guide to Clicker Docs PDF file to help understand features of Clicker Docs app. 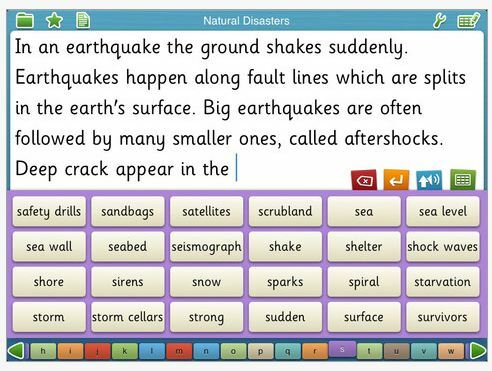 Clicker Docs, like Clicker Sentences apps are suited to the unique needs of students with literacy challenges. The provision of word prediction, text to speech, word banks are unique to only a few apps at the present time. Crick further supports therapists and teachers with pre-made grids, guides and the ability to share grids between users. I had the opportunity to be guided through features of Clicker apps by Neil Andrews, from Crick Software, who provided me with great information not only about their apps and Clicker 6 as well as practical application of their use. Ease of use of the apps are at the heart of their app development understanding the daily limitations of time faced by teachers and therapists. Crick provides some great apps, software and resources for supporting students with the writing process. Their commitment to developing software and mobile device apps provides the special needs community with a variety of choices for inclusion and home use. Thank you to Neil Andrews for sharing his time and app codes for Clicker apps! Clicker Docs and Clicker Sentences apps are definitely a tool that will be in my OT/AT mTool Kit! 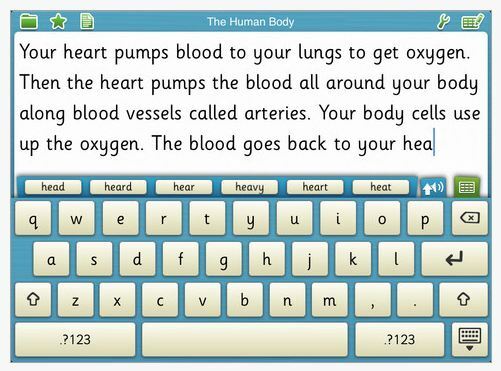 This entry was posted in App Reviews, Apps for OT's, Apps for Special Needs, Customizable app, Differentiation, Elementary School, iPad, Language Arts, Occupational Therapy, Primary Grades, School Based Interventions, Special education, Special Education Teacher, Special Needs, Text to Speech, Uncategorized, Word Prediction, Writing and tagged App Review, iPad, occupational therapy, OT Apps, special education, special needs students, Text to Speech, Word Prediction, Writing. Bookmark the permalink. Great review! I like what these two apps can do for the struggling writers in our midst…..Q: how does this app compare to that of Abilipad? We are trial using Abilipad with a few students in the upper elem. grades; this app seems to do as much and more? If you have used either or both, which did you find most user-friendly and helpful? Abilipad allows you to customize the keyboard contents. You can change the size and individual keys with single numbers/letters, words or phrases. You can also create a writing environment with a picture in the note pad section. With abilipad you can create writing or number production. It also has word prediction available for use. Clicker Docs and Sentence uses word banks as their main focus. The word banks are extensive, especially with Clicker docs and are easily set up and populated with theme words. Where as Clicker allows customization of the word bank for the writer I believe there is not number customization or as much keyboard customization. Both are great products, offer TTS, work prediction and their own type of customization. Both also have online sharing of customized boards for the apps. In answer to you about which did I find most user friendly and helpful, well it probably depends on what student I am looking at using it with. Both are quite user friendly. Clicker has great online resources and help menus, although I am sure Abilipad does also. I frequently head to YouTube to watch a quick video on an app for answers. This isn’t an indepth comparison but I hope it helps!